Ha! My super warn sleeping bag was a resounding failure in the night. I've slept through colder nights than last night, but somehow i just couldn't get warm and my sleep was sporadic at best. Now at 0700 I give up and get up. As i look at Marks tent i imagine him lying there, snug and warm on his comfy mattress, sleeping in a big comfy sleeping bag and if he gets a chill he just pulls the nice thick duvet up a little more. damn proud or stupid to admit i was wrong and that i should have accepted his offer of more bedding. I always thought I'd move beyond such stupid things as I grew older, it doesn't seem to be the case. I take comfort in the fact that i'll spend this evening back in the relative warmth of my house. As i take the tent down mark starts to pack his gear away. By the time I've packed and loaded the bike Mark's barely even started. We say our goodbyes and Mark promises again to read my website. The only plan today is to get back home safely. I suprise myself then when rather than taking the quick and direct route of the A55 to get home I find myself following a road that according to the maps on my fancy new phone should run me around the North Eastern side of the island. I dont even know why, but i'm heading for Amlwch. This takes me through gentle arable farmland and sloping hills covered with healthy looking sheep with young lambs in tow. Here and there cattle eat green grass and the odd tractor wanders aimlessly along dusty tracks. It's a lovely scene and the temperature has risen, yet i'm still chilly. I guess last nights cold has eaten into my ageing bones. The A5025 starts to follow the coast so at Porthllechog or Bull Bay I can see the coast and pull into a car park to stretch my legs and take a few pictures. I'm fairly certain I've not been here before. I dare not feel too proud of going somewhere new after yesterday's dissapointments though so I dismiss my childish thoughts of wild adventure. As I stand in the car park taking pictures and contemplating my lack of real adventure another car has pulled in. I didn't notice much at first but the occupants, an elderly couple, are looking at me in a most strange manner. I can only assume it's uncommon for middle-aged men on 125cc motorcycles to take pictures then stare into space on a car park in Porthllechog in the morning. Adventurous, no, but I could at least pass as weird. 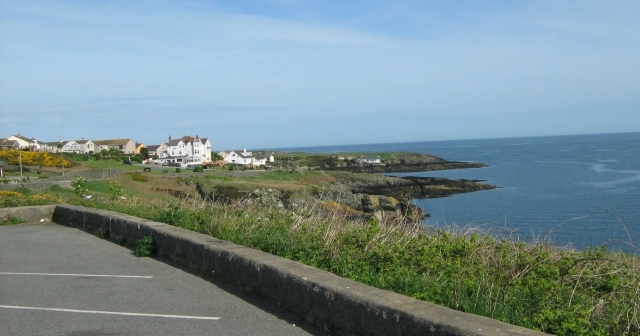 Porthllechog or Bull Bay, seen from the car park. The rest of the road brings more of the same rolling countryside. That's not to suggest it's boring, far from it. The Welsh mountians make an impressive backdrop to the gentle farmland. It's not a fast road though, caravans slow down a couple of frustrated bikers ahead of me and a few moves are made that make me whince. They eventually get past and judging by the lack of carnage they make it safely. I'm happy to sit back a little on the 125's small seat and let the greenery trundle by. The only problem on my mind now is food. By the time I get to the Menai bridge I'm starving. I recall memories of breaking down on a CD200 Benly here what must be 15 or 18 years ago! Nothing serious, a broken throttle cable which the kind AA man fixed. I scare myself when I think how long ago that was. Bangor is just over the Menai Bridge. This being Bank Holiday Monday and still quite early Bangor is quiet. For a city the bits I pass through seem quite nice. I'm not a fan of cities, but they have their uses. One of those uses is that it's easy to find supermakets and soon enough I'm sitting in the nice warm cafe of a Morrisons. At first a small breakfast for a couple fo quid seems quite resonable but by the time I've added my first cup of tea all weekend and a couple of slices of toast the whole lot comes to more that £4. Oh well, it's a treat for being so frugal over the rest of the weekend. By my reckoning I'm 110 miles from home. That means I could complete the whole jouney in one hit. I could. I could if I was capable of sitting still for 2 hours. On the big 600 I can barely manage 60 or 70 miles before I need to stop and stretch. At 55mph on the 125 I reckon the most I'll manage is 55 miles, one hour, before I need to stop. I envy those riders who seem to be able to ride for a full tank of fuel, 200 miles, 3 or 4 or 5 hours, before they stop. And then they only stop for fuel, not because they need to. So I ride the full length of the A55, from Bangor to Queensferry, non stop. It takes a little over an hour and by the time I pull into the Little Chef I'm aching, sore and stiff. A smoke and a good strech is enough to see me off again onto the M56 and I ride this up to the M6. I'm looking forward to getting home, unpacking and chilling out in a big big tent...my house. North Wales 2011 Short Break - Criccieth to Trearddur Bay Roaming around North Wales and the Llyn Peninsula Ren is killing time and exploring. This is what 125s were made for.